The year 2013 was a mixed bag for investors in farm commodities. While guar gum, guar seed and chana (chickpea) prices fell over 25%, coriander, pepper, castor seeds and soy meal returned over 15%. Out of the 21 major commodities which trade on the National Commodity and Derivatives Exchange (NCDEX), 11 gave positive returns last year. We discuss their prospects for 2014. Coriander: India is the world's largest producer, consumer and exporter of coriander. It accounts for more than 80% global production. Coriander is a rabi crop, sown between mid-October and November, and harvested in February-March. It is grown mostly in southeast Rajasthan. In 2013, coriander prices rose 47% as output went down drastically due to fall in area under cultivation and bad weather. However, there was a price fall towards the middle of the year (April-August) from Rs 7,646 a quintal to Rs 5,000. But the trend changed soon after due to lean supply and high exports. "Lower area under cultivation pushed up prices further and they touched Rs 7,853 per quintal on December 31," says Vedika Narvekar, chief manager, agri commodities, Angel Commodity Broking. On 1 January 2013, coriander was trading at Rs 5,366.40 a quintal. Market experts say that over the last few years, coriander production has not been stable, and has been fluctuating between two and four lakh tonnes. The 2012-13 production was near two lakh tonnes. Of this, the country exported 30,700 tonnes in January-September 2013 (valued around Rs 240 crore). Angel's Narvekar says coriander prices may keep rising in the first quarter of 2014 due to fall in stocks and area under cultivation. But prices may start falling from April as new crop comes to the market. Going forward, prices will take cues from export demand and output in other major producing countries such as Morocco, Canada, Pakistan and Romania. In the last quarter of 2014 (October-December), prices will depend upon monsoon rainfall and sowing expectations. Technically, coriander is expected to trade in the range of Rs 5,920-9,300 a quintal. Pepper: Strong demand, both in overseas and domestic markets, due to tight supply supported prices in 2013. Prices rose 37% from Rs 37,888 a quintal on January 1 to Rs 51,918 a quintal on December 31. Uncertainty over 7,000 tonnes pepper seized by the Food Safety and Standards Authority of India in response to reports about adulteration led to concerns over availability and supported prices. Exports in April-September rose 36% to 10,200 tonnes from 7,515 tonnes in the same period a year ago, according to the Spices Board. "India's pepper production next year is estimated to be 45,000-48,000 tonnes, a massive drop from the previous year's projection of 55,000 tonnes. Domestic consumption is estimated at 48,300-50,000 tonnes," says C P Krishnan, wholetime director, Geojit Comtrade. Limited availability means export demand is estimated to remain high in 2014 as well. "Prices are likely to stay firm, possibly around Rs 44,000-60,000 a quintal, with a positive bias. Anticipation of supply crunch due to probable fall in output in India is likely to support the commodity. An unexpected fall below Rs 40,000 will signal weakness," says Krishnan. Castor Seed: Castor seed is sown in July-August. The crop starts arriving in the market from December. Gujarat accounts for 86% of the country's production. It is followed by Andhra Pradesh and Rajasthan. Castor oil (extracted from castor seed) and its derivatives are used to make soaps, lubricants, hydraulic/brake fluids, paints, dyes, coatings, inks, cold-resistant plastics, wax, polishes, nylon, medicines and perfumes. India is the biggest exporter of castor oil and accounts for 70% global trade, followed by China and Brazil. On the NCDEX, prices rose 21% from Rs 3,731 a quintal on 1 January 2013 to Rs 4,512 on December 31. 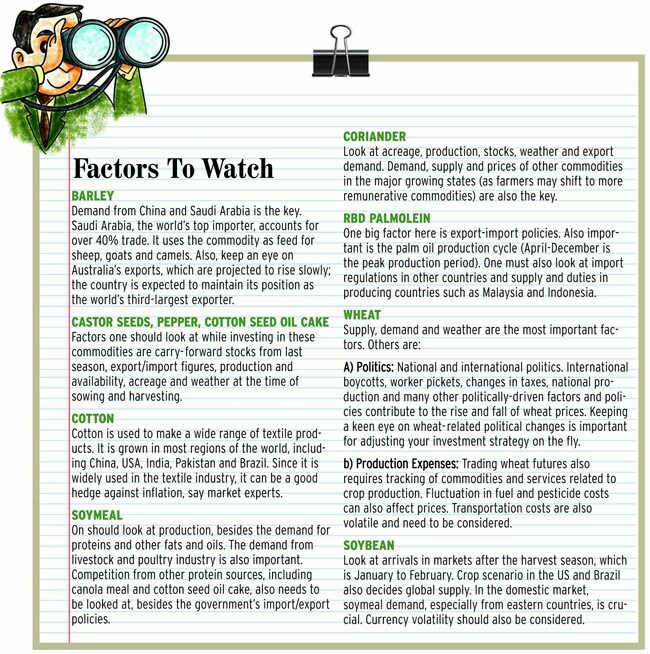 Kunal Shah, head, commodity research, Nirmal Bang, says, "Castor seed prices shot up mainly because of high exports." Experts say carryover stock in January 2014 is expected to be close to four lakh tonnes, down 50% from the previous year. India had eight lakh tonnes stock at the start of 2013 due to bumper output in 2012. Availability of castor seed in 2014 is expected to be 14.5 lakh tonnes as against 20.5 lakh tonnes in 2013. Reports about fall in area under cultivation and depleting stocks have already led to a sharp rise in castor seed prices. According to Nirmal Bang Commodities, supply in 2014 is likely to be 14.5 lakh tonnes. However, demand is likely to stay steady at 16.5-17 lakh tonnes. Nirmal Bang's Shah is bullish on the commodity. "We expect 2014 exports to be 5.3-5.8 lakh tonnes. Since prices have shot up, we may see some moderation in export demand in 2014. Prices are likely to stay around Rs 5,000-5,100 per quintal on the back of fall in carryover stocks and production." Soymeal: Soymeal is one of the largest sources of protein. Nearly 98% production is used to make animal feed. India is one of the biggest exporters. South Korea, Japan, Thailand, Vietnam, Indonesia and Iran are the biggest importers of Indian soymeal. The Soybean Processors Association of India says exports in April-November 2013 were 15.90 lakh tonnes as compared to 14.05 lakh tonnes in the same period a year ago. However, imports of soybean meal in 2013 were 6,000 million tonnes as compared to 8,000 million tonnes in 2012. "Prices of Indian soybean meal are higher than that of supplies from South America, which could hit demand for the Indian produce. Thus, the domestic stock will increase, and prices fall," says Vivek Gupta, director, research, CapitalVia Global Research. Strong export demand pushed up prices by 18% in 2013. "Higher margins overseas and weak Indian currency led to a rise in exports and domestic prices. High soybean prices also had an impact," says Vivek Gupta, director, research, CapitalVia Global Research. Faiyaz Hudani, associate vice president, research, Kotak Commodities, seconds Gupta. "Export demand led to a rise in prices. In India, exports have been in the range of 3.1-4.2 million tonnes or MT. We expect that the 2014 figure will be 3.5-4.5 MT." Hudani of Kotak expects a price slump due to higher production in Brazil and Argentina. But CapitalVia Global Research's Gupta says prices may fall till March in view of lower domestic soybean prices due to higher arrivals and expectation of good production in South America. From March-April, we can expect a bounce-back. By December, soymeal prices may touch Rs 35,700-36,000 per tonne. On December 31, they were at Rs 33,150. RBD Palmolein: RBD Palmolein is refined, bleached and deodorised form of palm oil, extracted by crushing palm fruit. It is an important raw material in soaps, washing powders and other hygiene and personal care products. It is also used for cooking. Indonesia and Malaysia account for nearly 87% global production. The other big producers are Columbia, Thailand and Nigeria. India is one of Asia's largest vegetable oil importers. It imports roughly 2.9 million tonnes palm oil and its variants every year. The domestic production is just 0.5 lakh tonnes. In 2013, crude palm oil outperformed other items in the edible oil category; it rose more than 14%. It was at Rs 570 per 10 kg on December 31 as against Rs 498 on January 1. "In the domestic market, prices got support from rising consumption of vegetable oil, lower availability of the competing soy oil and steep rupee fall (which made imports costlier)," says D K Aggarwal, chairman and managing director, SMC Investments and Advisors. The Central Organisation for Oil Industry and Trade says vegetable oil availability in the 2013-14 season from kharif oilseeds crop and secondary sources is estimated at 58.03 lakh tonnes as compared to 52.65 lakh tonnes in 2012-13. However, the per capita consumption is expected to rise by 3-4% per annum. "This will be driven by growing population, rising incomes and higher supplies. The per capita edible oil consumption in India is increasing (estimated at 14.04 kg for marketing year 2012-13, that is, October-September). This is far below the world average of 22.4 kg," says Aggarwal of SMC Investments and Advisors. "Crude palm oil futures on the MCX (Multi Commodity Exchange) may continue to face resistance near Rs 590 per 10 kg and correct due to lack of demand. With the onset of summer, the counter is likely to fall further towards Rs 510 per 10 kg, breaching the Rs 540 level by August-September," he says. On January 8, palm oil futures for April expiry were trading at Rs 552 per 10 kg on the MCX. Cotton: Crop damage, fall in area under cultivation and limited supply pushed up prices by 14% in 2013. On the NCDEX, cotton was trading at Rs 998.65 per 20 kg on December 31 as against Rs 873 per 20 kg on January 1. The cyclone Phailin hit the crop in Andhra Pradesh, which accounts for 15% of the country's production. Also, in the initial harvesting period, the output reaching Gujarat's markets had a lot of moisture, which led to lower buying by stockists and millers. "Stockists built inventories when the quality improved, which supported prices. Also, acreage fell 3%," says Aurobinda Prasad, chief research analyst, commodities, Karvy Comtrade. Prasad is bullish on the commodity for 2014. He says demand from South Indian mills continues to be high. However, lower exports may limit the price rise. 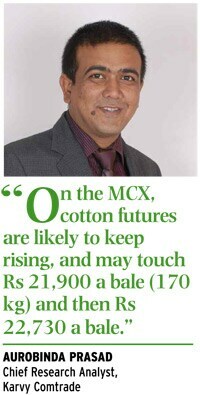 On the MCX, cotton futures are likely to keep rising, and may touch Rs 21,900 a bale (170 kg) and then Rs 22,730 a bale. Lower-side support levels are Rs 19,100 and then Rs 18,200. But the bullish trend is intact. On January 6 this year, the price was Rs 19,530 a bale. Soybean: Soybean prices also rose in 2013 as late rain damaged the crop in Madhya Pradesh. In 2013, prices rose 10.5% and touched Rs 3,687 per quintal on December 31 as against Rs 3,338 on January 1. However, on account of good harvest in the US in July, prices fell sharply to Rs 3,128 a quintal. For 2014, Vibhu Ratandhara, assistant vice president, commodity, Bonanza Portfolio, says, "Prices in the first half will be decided by new arrivals and quality while weather will be the key factor in the second half." However, fundamentals suggest that soybean is likely to remain under pressure in 2014 due to rise in supply. Cotton Seed Oil Cake: Cottonseed oil cake is de-oiled cotton seed. It is widely used as cattle feed. Europe and South Korea are the major importers. In 2013, prices rose 8.3% and were Rs 1,442.50 a quintal on December 31 as against Rs 1,331 a quintal on January 1. The reasons were the price increase in global markets and rising consumption. "Technically, on the NCDEX, cotton seed oil cake is in a bullish trend. It has been trading above Rs 1,380 per quintal since February 2013," says Gupta of CapitalVia Global Research. Production rose 4.51% to 41,70,000 MT in 2013 as compared to 39,90,000 MT in 2012. Domestic consumption rose 5.18% to 41,65,000 MT compared to 39,60,000 MT in 2012. Gupta says prices may keep going up in 2014 due to rising consumption. Technically, a fall is expected in the short term, and prices can test Rs 1,300-1,250 per quintal before rising till March-April 2014. From April-May 2014, an uptrend could begin, and by December 2014 prices could test Rs 1,550-1,650 per quintal on the upside. Wheat: The Cabinet Committee on Economic Affairs approved a 5% increase in the minimum support price of wheat for the 2013 marketing year. As a result, wheat prices on the NCDEX rose from Rs 1,573 per quintal on January 1 to Rs 1,659 on December 31. Nikhil Kamath, director, Zerodha, says, "We expect stable prices in 2014." Production rose sharply from 75.81 MT in 2006-07 to 94.88 MT in 2011-12. Productivity, which was 2,602 kg per hectare in 2004-05, was 3,140 kg per hectare in 2011-12. The biggest producers are Haryana, Punjab and Uttar Pradesh. "In 2013, India exported 86 MT wheat, about 13% of the total global production," says Kamath of Zerodha. Barley: Prices have been rising since January 2006 due to high exports. Hanish Kumar Sinha, head, trade and commodity intelligence group, National Collateral Management Services, says world barley stocks are likely to end 2012-13 at a five-year low of 22.5 MT, with a sharp 14% drop in inventory in major exporting countries to 12.5 MT, the lowest in 17 years. In 2013, barley prices rose 1.72% on the NCDEX and were at Rs 1,659 a quintal on December 31 as against Rs 1,573 a quintal on January 1. India's production in 2012-13 is estimated at 1.74 MT, marginally higher than the 1.62 MT in the preceding year, owing to good rains in the kharif season and improving yields due to high MSP. Over 91.71% production was contributed by Rajasthan (48.75%), Uttar Pradesh (24.96%), Haryana (9.45%) and Madhya Pradesh (8.54%). "The domestic consumption is estimated at 1.5-1.75 MT. India is the 14th -largest consumer, with the leaders being European Union (37.91%) and China (9.57%)," says Sinha. Barley is sown in October-December and is dependent upon a good monsoon. According to market experts, this year, good rainfall in major producing regions will provide the required soil moisture. The upcoming season is likely to see production of 1.7-1.8 MT. Sinha of National Collateral says barley is expected to continue trading on the higher side due to lower production in the European Union. However, spot prices are expected to rise on the back of high export demand and get support at Rs 1,172 per quintal. It has a good possibility of testing Rs 1,740 in 2014 on the higher side.